Having a newborn is good for many things. It’s not good for sleep. It’s not good for actually completing tasks. But it is good for watching TV! I spend most of my day either feeding a baby, trying to get a baby to sleep, or holding this sweet baby when he’ssleeping. More productive people may read a book during this time, but I’ve been watching a bit a lot of Netflix. I started with Royal Pains – light and poppy. Then I moved on to Call the Midwife. It’s a moving series, very respectful, and very real. Chummy and Peter are endearing, in all their dorkiness. Call the Midwife is full of a lot of thought provoking stories and lines. If you find yourself with a spare 15 hours, I recommend you check it out. No point in ambitions if you don’t try to achieve them. How many of my ambitions, goals, God-given dreams have languished because I haven't actually done the hard work to try to achieve them? When have I chosen watching TV instead of studying for that professional certification I want to get? When have I stayed up too late horsing around on the internet, then I don't get up to exercise, and then I'm not prepared to participate in a race? Right now, in this oh-so-short season of a newborn, may not be the time to put too much pressure on myself to pursue some of these other ambitions (besides, raising children is one of my ambitions!) But it was a good reminder that I need to keep the dreams and goals God has put in my heart in sight. So I'm going to call some of the 'midwives' in my life. Not the team who helped me and Andy have our babies (although they were fabulous!) but some friends who are figurative midwives, who walk along side me and help me birth my dreams. 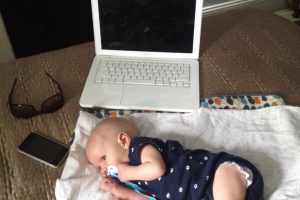 This is my usual set up: an old iPhone playing white noise for the baby, a screen to watch Netflix (using subtitles), and a baby who just woke up, 7 minutes after he fell asleep and I thought I could get something done!